What is the measurement problem? After discussing the category theory approach of quantum mechanics reconstruction I want to start a series of posts discussing the so-called measurement problem. Is the wavefunction collapse real? The views on this topics varies wildly and touches a lot of raw nerves because it goes to the heart of quantum mechanics interpretation. Outside the foundations community, one prevalent attitude is that I know very well how to use quantum mechanics in my day to day computations which keep me very busy, and if I only have one free afternoon to think about it I will surely solve it. But this is actually a hard problem, and moreover I will attempt to show that all known solutions are incorrect/incomplete in one form or another. 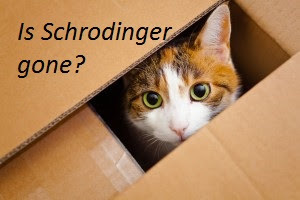 Because the category theory approach was successful in deriving quantum mechanics from physical principles, it is natural to expect that it also offers hints on solving the measurement problem. And the solution turns out to be completely unexpected, an entirely new paradigm. To set the stage, I can argue that the best solution so far to the measurement problem is offered by QBism. This is not without issues however (but not what people usually use against the epistemic interpretation), and I will attempt to make the epistemic interpretation mathematically rigorous. As an analogy consider the usage of \(ict\) in special relativity. Time is not an imaginary distance and the proper way to understand relativity is by using the metric tensor. Similarly in quantum mechanics if we are sloppy and ignore a mathematical construct which naturally appears in category theory, we can talk about collapse. This is interpreted differently by various quantum mechanics interpretations. In many worlds, the world splits in two branches, and in each branch we have an outcome. In Bohmian, we add a hidden variable, the position, and different initial conditions lead to the A or B outcomes. In Copenhagen, the wavefunction only predicts potential outcomes and the collapse is only an information update. One criticism people level on this is the Wigner's friend problem. (QBism has a good answer to this criticism). Bohmian violates S1 and respects S2 and S3. will turn out to be bogus. There is only one outcome from any experiment which occurs when the quantum system interacts with the measurement device, the Wigner's friend and quantum eraser has natural explanations, and we can talk about collapse when we sloppily ignore a mathematical structure. The epistemic information update will be rigurously described in a precise mathematical way. Please stay tuned. "I can argue that the best solution so far to the measurement problem is offered by QBism." That's the position of Lubos, too, no? The absence of what we call real, QM being only a tool to make predictions about future observables. More or less Lubos agrees with QBism, but I think his position is not crystal clear as he supported consistent histories as well. (I think QBism is a notch better than consistent histories.) It is safe to say Lubos is in the Copenhagen camp, as many more people are. If qbism is done from the Bayesian perspective (nothing wrong with it) I'll approach the problem from the equivalent frequentist point of view. The wavefunction does not carry energy and momenta and it is only a tool used to predict outcomes. It also has several very different mathematical representations and one cannot call one such instance reals and deny reality to the other representations. Hi Ruth, nice to see you here again. I don't quite get what you say: which dogmatic assertions are you talking about? By the way, I was pondering on your position on Zurek's envariance and see if it applies to my approach as well. Unlike Zurek I don't use a system-environment swap symmetry but a measurement outcome swap symmetry. In my case the measurement device outcomes are distinguished but this is is justified by the very definition of a measurement device so I think I am OK.
On von Neumann measurements of the first kind, I have a rigorous mathematical proof it is wrong.